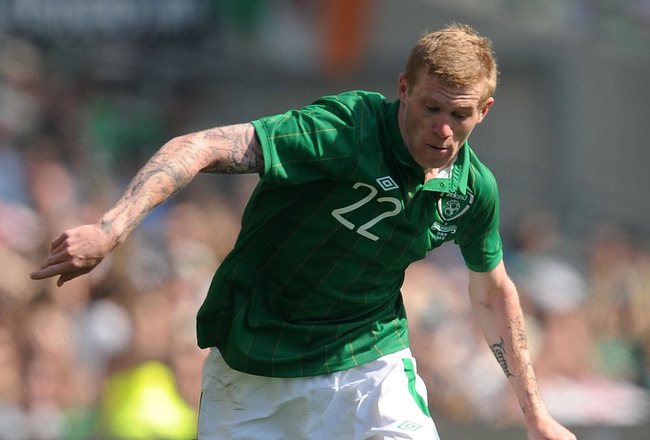 Wigan Athletic winger and Irish international, James McClean, has released a statement – in the form of an open letter to his club chairman – explaining why he won’t be wearing a poppy during this year’s 100th anniversary of WW1. I have complete respect for those who fought and died in both World Wars – many I know were Irish-born. I have been told that your own Grandfather Paddy Whelan, from Tipperary, was one of those. Mr Whelan, for me to wear a poppy would be as much a gesture of disrespect for the innocent people who lost their lives in the Troubles – and Bloody Sunday especially – as I have in the past been accused of disrespecting the victims of WWI and WWII. The man should be commended. Not only for an action that is brave, principled and honest but for one that contains a degree of risk; both to himself and his career. Unthinking soldier worship and poppy fascism are now disturbing aspects of the collective British psyche; it’s a courageous or reckless individual who bucks the trend of this particular brand of what is now almost mass hysteria. The poppy and Remembrance commemorations – along with the hideously mawkish Help for Heroes – have been hi-jacked by politicians intent on equating the imperial bloodbath of WW1 with a noble sense of patriotism and duty; all the better to justify current and future wars. As with so much of British history, or rather establishment propaganda, these things are really about the present and the future; not the past. The cynical usurping of the poppy’s original symbolism – peace, end to imperialist killing etc – for purposes of justifying the government’s appalling murder-fests elsewhere around the globe is truly repellent. It is now utterly tainted and beyond redemption as any kind of worthwhile symbol. Sadly, it is rarely worn by its supporters to commemorate working-class canon fodder who died in an ugly and immoral dust-up between capitalist powers, scrapping over markets and territory. No, it’s an expression of militarist jingoism. They’ll tell you they’re honouring the ‘fallen’ who died so that we might be free. In reality, armed forces are usually the enemies of freedom. As James McClean clearly understands; as did the invaded and subjugated millions who suffered under the jackboots of the British Empire. The same British Army went into Tonypandy ready to shoot striking miners on Churchill’s orders. They rolled their tanks down the streets of Glasgow, prepared to crush the resistance of their own people. In reality we owe our freedom to those who opposed the state’s armed might – the suffragettes, the Chartists and the Tolpudlle Martyrs, to name but three. It’s a depressing truth that we can’t wear a poppy and have people immediately know that we feel WW1 was futile and that every single dead soldier was a wasted life. Their deaths meant nothing, achieved nothing and changed nothing. Remembrance Sunday is offensive not least because it paints an entirely false and dishonest picture; that those who died did so for ‘their country’ and that that’s somehow noble. It isn’t. It’s the Big Lie. If we wore poppies and held Remembrance Day parades to apologise to those slaughtered, if such events were collective acts of penance and regret for the sheer pointless waste of human life, for industrial-scale mass-sacrifice on the alter of selfish economic gain, then they would be truly worthy. But they aren’t. The whole sickening jamboree is a carnival of dishonesty, hypocrisy and reaction. We should play no part in legitimising that. We should not be complicit in brainwashing future generations. We should reject absolutely that invading and then perishing in foreign lands, purely to further US-Brit geopolitical interests and control of other’s resources, is a worthwhile and moral objective.